The studios here in Speyer are quite large and having so much space in which to work is a real luxury. I decided last week that it was about time to work on a larger scale and make the most of the situation. Thinking about the practicalities of getting work back to Scotland I decided there would have to be limits to the size of the paintings however ….100 cm x 140 cm seemed ideal and Mike went out and got me two pieces of board this size. Being mdf, it weighs quite a lot but I should be able to get the finished pieces back reasonably cheaply with a bit of luck. 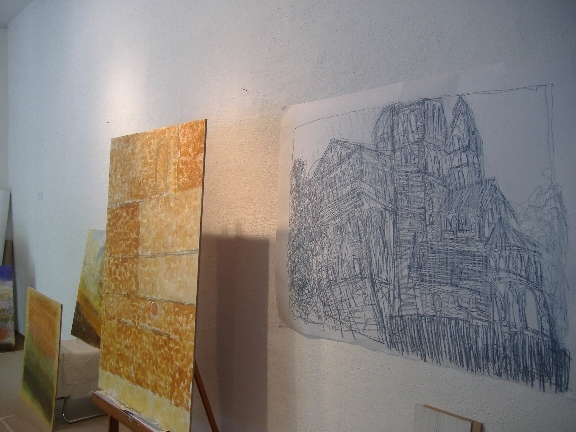 I also have a large roll of thick white paper …this is 150 cm wide and the roll is several metres in length and so offers me chance to do some pretty big drawings. These will be easier to send home …I’ll just need to find a cardboard tube to protect them. Of course, working on a large scale means using a lot more materials and although I brought with me a lot of paint, I only brought a fairly small number of oil pastels. But panic not …there happens to be a wonderful art supply company called ‘Boesner’. Their stores are great, the two I’ve been taken to, being situated in large factory units on industrial sites and stocking a HUGE variety of art materials. I’ve never seen anything like it. Mind you, they’re dangerous places …you can end up spending a fortune if you’re not careful! Anyway, I was there to buy pastels. I use “Neopastel” made by a Swiss company I think. They’re fantastic oil pastels, not the cheapest but they’re wonderful colours and are neither too hard or too soft ….perfect I’ve found for working (as I do) on board. “Neopastels” come in a huger range and I was relieved to find the Boesner not only had all of them but also had plenty of each ….this was a serious bit of pastel buying! In the end, I bought just over seventy pastels which should be enough to keep me going while I’m here in Speyer. It may sound a lot, but working with them on board as well as not top of paint, really eats them up, especially when doing large pieces. Anyway, if I don’t use them all here …I’ll have them for the work I’ll be doing on my return to Scotland. Mike Lauter was with me helping to find the colours I needed and he spotted a great little tool for holding the pastels. It’s a bit like an old fashioned cigarette holder and it allows you to use the pastels right down to the end ….should save me having that annoying bag of bits you always end up with! I’ve tried using it and it works well. It allows me to make a greater variety of marks too which is quite interesting. 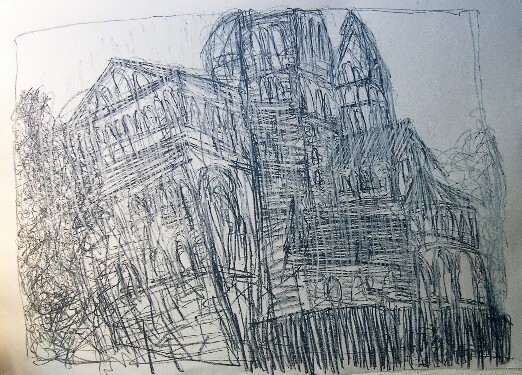 So far I’ve used one of the big boards as a drawing board and have completed one drawing this size – a loose and vigorous impression of the one end of the cathedral. As with my hill based landscape work, this isn’t an accurate drawing of the structure, I don’t really see that. It does though try to put over something of the great bulk of the structure, especially when seem from the one end. I wasn’t too sure about the drawing when I completed it, but a few days on and I’m getting quite pleased with it. I’ve started a painting on the other big board. As I’ve said in the past since I’ve been here, I really like the walls of the cathedral. There’s one section that has two semicircular indents that I really like …it reminds me of eyes. So then, very simply, this painting is about this section of the wall. I’m not quite sure how it’ll end up but it’s going to be interesting and great to work on this scale again. I’m also working on two smaller pieces (80 x 80 cm), one of which is based on the other end of the cathedral and is a fairly abstract piece. The other is a reworking in paint of an earlier smaller Scottish painting. I’m hoping the two pieces will work well together. They’re both coming on well although there’s much work to be done but it does leave me with no new boards to start …..have to speak nicely to Mike and see if he’ll go get another four for me. Right then, typing finished …back to the paint…. >> Next Post: Hot and humid and late!